"What sets Terminix Commercial apart is our awareness of our customers’ needs and commitment to partnership"
MEMPHIS, Tenn.--(BUSINESS WIRE)--Terminix Commercial, a division of ServiceMaster (NYSE: SERV), today released its first-ever Pest Perceptions Report, an in-depth study of the pest problems businesses such as hotels, restaurants, retailers and apartments face, as well as their confidence in taking them on. The report reveals surprising truths about pests in commercial settings, and commemorates Terminix Commercial’s new brand launch to demonstrate its commitment to putting business first. Pest Perceptions reveals the most commonly reported pests are ants, cockroaches and rodents, but pests affect each industry differently. Small- and medium-sized merchants, such as restaurants and hotels, report significantly more challenges with pests such as rodents and flies. Real estate property managers report issues with cockroaches more than other industries, and large-scale retailers are most concerned with bed bugs and termites. It’s clear that pests’ aftermath goes far beyond physical damage, as more than 50 percent of businesses say negative word of mouth causes the greatest damage to their organization after a pest issue. Furthermore, 78 percent of business leaders with pest control in place are confident their businesses are pest-free, yet 65 percent still feel vulnerable to a pest infestation, showing the importance of having a reliable pest management partner who’s ready whenever pests strike. Because Terminix Commercial knows no two businesses are alike, the report provides in-depth analysis of how industry and region can affect why businesses choose to have a pest control provider, the most common pests organizations face, and more. For instance, businesses in the Southern region of the United States report cockroach challenges more frequently than other areas, while their peers in the West report termites more than other parts of the country. This deep understanding of what makes businesses tick is a fundamental element of Terminix Commercial’s new brand. As a part of the rebrand, the company has rolled out a new logo, head-to-toe revamp of the brand’s mission and deep focus on the core tenets that provide the most value to customers to help protect their investments and reputations. The full Pest Perceptions Report is available on Terminix.com. Terminix Commercial partnered with B2B International, a third-party market research provider, to research decision makers’ attitudes and perceptions of pest control services through a survey and focus groups. The survey reached 900 decision-makers and significant influencers on purchasing pest control in key verticals, including retailers, restaurant owners, hoteliers and real estate property managers across the country. Terminix is the leading provider of termite and pest control services in the United States. Headquartered in Memphis, Tenn., Terminix services approximately 2.8 million residential and commercial customers in 47 states and 18 countries. Terminix provides pest control services and protection against termites, rodents and other pests. Terminix is a business unit of ServiceMaster Global Holdings, Inc. (SERV), a leading provider of essential residential and commercial services. Terminix is the Official Pest Control Partner of Minor League Baseball™. To learn more about Terminix, visit www.Terminix.com. ServiceMaster (NYSE: SERV) solves the homeowner’s dilemma. Every day, we visit tens of thousands of homes and businesses through our extensive service network of expert professionals. Our well-recognized brands include AmeriSpec (home inspections), Furniture Medic (furniture and cabinet repair), Merry Maids (residential cleaning), ServiceMaster Clean (janitorial and residential floor cleaning), ServiceMaster Restore (disaster restoration), Terminix (termite and pest control) and Terminix Commercial (commercial termite and pest control). Like, follow or visit us at facebook.com/ServiceMaster, linkedin.com/ServiceMaster, twitter.com/ServiceMaster, or servicemaster.com. ServiceMaster is the Official Home Services Provider of Minor League Baseball™. 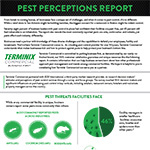 Terminix today released its first-ever Pest Perceptions Report.